Parrots are birds of the order Psittaciformes. 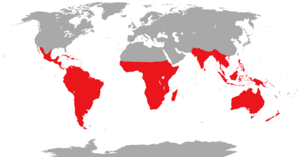 There are roughly 372 species in 86 genera and they are found in most tropical and subtropical regions. The greatest diversity of parrots is found in South America and Australasia. Parrots are intelligent birds. 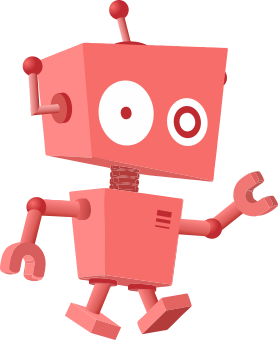 They have relatively large brains, they can learn, and they can use simple tools. Because some species have the ability to make sounds like human voices and have plumages with bright colors, many species are kept as pets. This includes some endangered and protected species. Parrots have a heavy, in relation to their size, and compact body with a large head and a short neck. Their beaks are short, strong and curved. 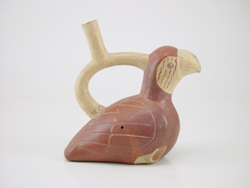 The two parts of the beak are very strong and used to break fruits and seeds. The tongue is large and strong. They have strong legs, and clawed zygodactyl feet (with two toes facing forward and two toes facing back) that are very useful to climb up trees. Many parrots are vividly coloured, and some are multi-coloured. The plumage of cockatoos ranges from mostly white to mostly black, with a mobile crest of feathers on the tops of their heads. Most parrots exhibit little or no sexual dimorphism. They form the most variably sized bird order in terms of length. The smallest of the parrots is the pigmy parrot (Micropsitta pusio) with and adult weight of 11.5 g (0.41 oz) and a length of 8.6 cm (3.4 in). With a length (from the top of its head to the tip of its long pointed tail) of about 95 cm (37 in), the hyacinth macaw (Anodorhynchus hyacinthinus) is longer than any other species of parrot, although half that length is tail. The order is subdivided into three superfamilies: the Psittacoidea ('true' parrots), the Cacatuoidea (cockatoos) and the Strigopoidea (New Zealand parrots). The greatest diversity of parrots is found in South America and Australasia. The most important components of most parrots' diets are seeds, fruits like nuts, buds and other plant material. A few species sometimes eat animals and carrion, while the lories and lorikeets are specialised for feeding on floral nectar and soft fruits. Almost all parrots nest in tree hollows, and lay white eggs from which hatch altricial (helpless) young. Parrots are among the most intelligent birds, as are the crow family: ravens, crows, jays and magpies, and the ability of some species to make sounds like human voices enhances their popularity as pets. 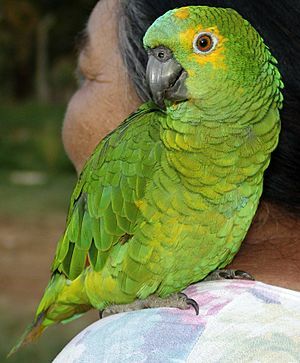 The capture of wild parrots for the pet trade, as well as hunting, habitat loss and competition from invasive species, has diminished wild populations, with parrots being subjected to more exploitation than any other group of birds. Measures taken to conserve the habitats of some high-profile species have also protected many of the less charismatic species living in the same ecosystems. Some parrots live up to 80 years. 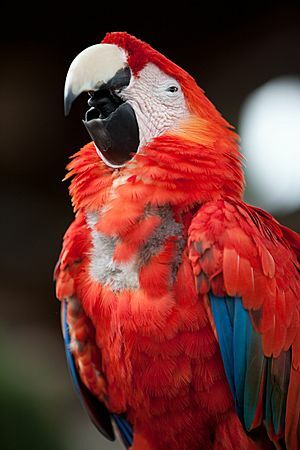 Many parrots can imitate human speech; they can speak simple words if repeated a few times. Transposons in the genomes of passerines and parrots are similar, but those in the genomes of other birds are not. This is strong evidence that parrots are the sister group of passerines. 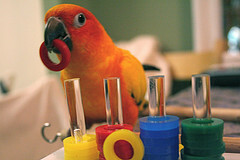 Europe is the origin of the first presumed parrot fossils, which date from about 50 million years ago (mya). The climate there and then was tropical. Several fairly complete skeletons of parrot-like birds have been found in England and Germany. On the whole it seems likely that these are not direct ancestors of the modern parrots, but related lineages which evolved in the northern hemisphere, and which have since died out. The earliest records of modern parrots date to about 23–20 mya and are also from Europe. Subsequently, the fossil record—again mainly from Europe—consists of bones clearly recognisable as belonging to parrots of modern type. The southern hemisphere does not have nearly as rich a fossil record for this period as the northern, and contains no known parrot-like remains earlier than the early to middle Miocene, around 20 mya. The first unambiguous parrot fossil (as opposed to a parrot-like one) is found in the Miocene. It is an upper jaw, identical that of modern cockatoos. A white-eyed parakeet couple eating queen palm seeds; parrots have curved and strong beaks that can break very hard seeds. The vast majority of parrots are, like this feral rose-ringed parakeet, cavity nesters. Ten thousand hyacinth macaws were taken from the wild for the pet trade in the 1980s. As a result, Brazil now has only a very small number of breeding pairs left in the wild. Deforestation pushed the Puerto Rican amazon to the brink of extinction, still remaining among the world's rarest birds despite conservation efforts. Parrot Facts for Kids. Kiddle Encyclopedia.